SSR LLC – Nitrogen Fertilizers – A Game Of Thrones Winter! 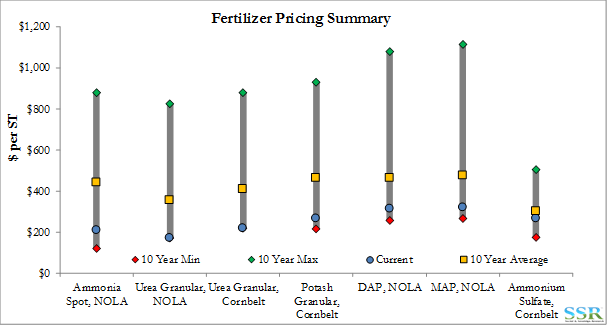 As shown in Exhibit 1, we are trying to set records for lowest prices in almost every major fertilizer group in Q2 2017, with Ammonia and Ammonium Sulfate the only exceptions. Urea pricing has only been lower pre-2000 when US natural gas pricing was sub $2.00 per MMBTU. Potash and phosphates are also touching ten year lows. 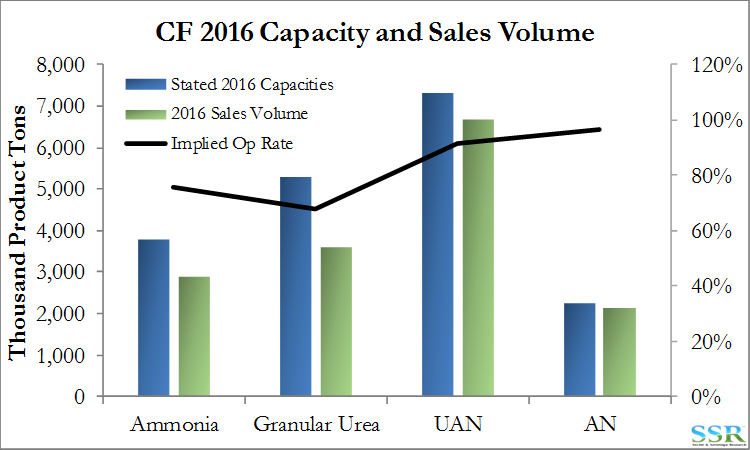 New capacity is most acute in Urea, especially in the US, with current local pricing reflecting the need to encourage importers to look for more attractive markets elsewhere. This transition may take some time as importers are entrenched in the US, having been part of the market since the early part of the last decade. Worst case: we could see break-even pricing extend through the 2018 application season. Ammonium Sulfate looks slightly better, but this is likely because there has been no capacity addition as this is largely a by-product of caprolactam production – a slow growing market with little investment. ASIX, a small cap stock we like, is a beneficiary of better Ammonium Sulfate pricing. Despite the current lows, and, in our view inevitable negative revisions for 2017 and 2018, Urea probably presents the most interesting investment controversies over the near term. Estimates for Q2 for CF, UAN and LXU do not, in our opinion, reflect the sequential decline in pricing and margins – so we likely have bad news near-term and probably negative guidance. CF has the cash flows and the low costs to survive a protracted downturn and an expectation reset with Q2 earnings may provide an interesting entry point for those with a 2-year view. A protracted trough is problematic for UAN and LXU (more so for LXU). While both have equity which is more levered to a recovery than CF, both could fail in a protracted trough. Is it the dark before the dawn for fertilizers – or has “winter” come? CF tries to paint a positive picture or put a positive spin on a chart the company included in its recent presentation, talking about how, after 2018, capacity additions lag expected demand growth, but the additions from 2015 through 2018 are enormous and may take years to work off. CF is lucky; the company has very low cost production, plenty of cash and essentially enough “wood and supplies” to see them through a very protracted “winter”. The same cannot be said for UAN or LXU, both of which should have materially worse Q2 results than Q1 and should the rest of the year look similar to Q2, which is possible, may run out of both cash and willing lenders before the end of the year. UAN’s share price already reflects the predicament to a degree, but LXU’s price is supported by the “strategic review” initiated in November 2016, in our view. We do not expect LXU to find a buyer and see as much as 50-75% downside in the stock before year-end, at which point a buyer may emerge. Urea pricing has bumped off a very low and unprofitable bottom over the last couple of weeks, (with Q2 pricing around $50 per ton below Q1) but only by a few dollars per ton, with the seasonal peak in demand now behind us. If this is the bottom, it may signal a good entry point for CF, probably after the quarter is announced and expectations for 2017 are reset. 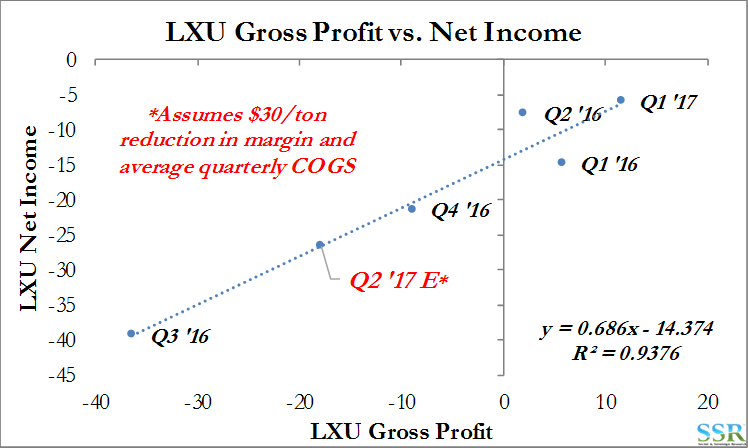 If we sit somewhere between Q1 and Q2 pricing and margins for the rest of the year we think that both UAN and LXU have problems. 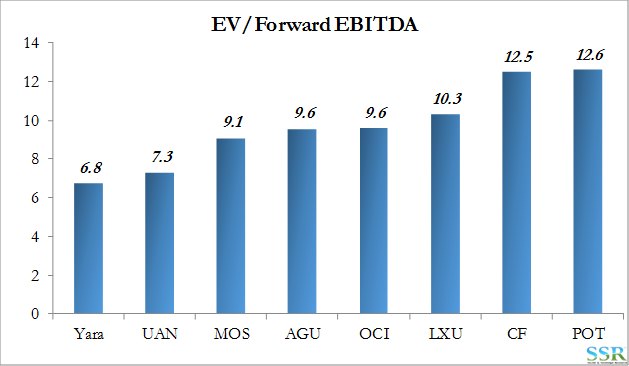 Valuation for UAN reflects greater concern than for LXU – Exhibits 2 and 3 – but most of the stocks are reflecting multiples of what are expected to be trough earnings and our analysis suggests that LXU has more difficult cash flow issues this year than UAN if current pricing and margins persist. The risk to owning CF today, despite its attractive valuation, is that the trough is protracted and the dividend is cut – we estimate downside to $25 without a dividend cut and perhaps a few dollars lower with a dividend cut. Note that our “normal” mid-cycle value for CF is higher than $60 per share – based on historic mid cycle return on capital and the increased capital base at the company. We would expect the share price to move up quite quickly once investors are comfortable that they understand the depth and likely duration of the trough. The challenge for US Urea and other nitrogen fertilizers is not simply the addition of significant US capacity over the last 18 months, but also the need to materially change trade flows in order to accommodate that capacity. On paper, the US has not added enough capacity to become a material net exporter, but as the country has been supplied by significant net-imports for the last 10+ years, the owners of the new capacity have to find a way to discourage the importers and encourage them to look elsewhere – this can only be achieved through a price war and with US producers currently getting higher netbacks from exports than they are from domestic sales, it is fair to say that we are in the heat of battle. The importers include some big names with established import facilities, transport networks and contract customers in the US and they are in the habit of doing business here. Habits are hard to break, especially if there is an exit cost; dismantling or selling infrastructure and shutting down sales and marketing operations. It is unlikely that this happens on the back of a couple of poor quarters, and we think that it will take at least another 12 months before we see trade flows that better reflect local supply/demand and economics around the world. Logically, the export markets that the US producers are finding should be served by the US importers and the US producers should sell more at home. This all probably means a very poor 2017 for nitrogen, with the recent small positive move in pricing unlikely to turn into a meaningful recovering trend for a while – maybe 2018, but possibly 2019. 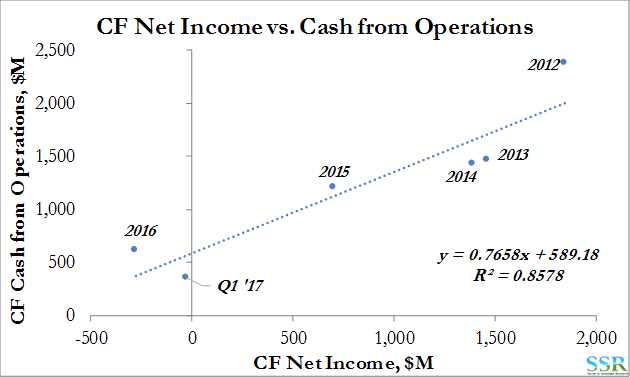 CF is doing the right thing – as the low-cost producer the company is running flat out – Exhibit 4 – and while this will likely lead to losses in 2017, the company should generate enough cash to keep the dividend at current levels. That said, if CF believes that the fight will take a couple of years we would encourage the company to take any necessary dividend cut now – coincident with Q2 earnings and cautionary guidance for 2H 2017. Rebasing for the year and for the cash flows would likely allow the stock to find a floor. It might also accelerate some of the restructuring that the rest of the industry probably needs – CF can take the pain, whereas others cannot. 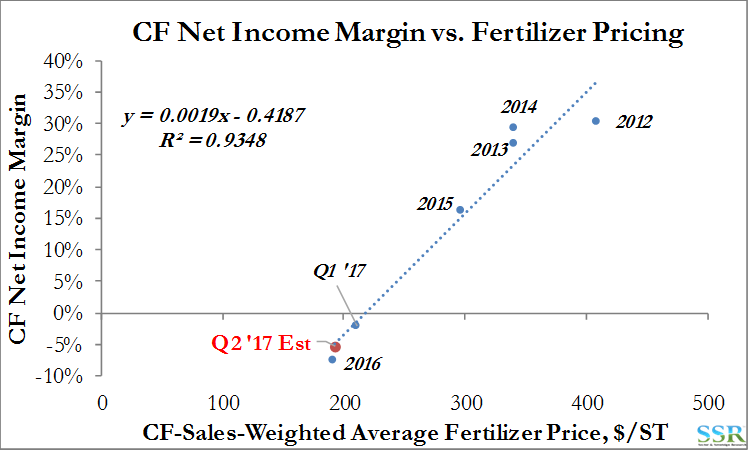 Current fertilizer pricing implies a 2016-like -5.2% net income margin for Q2 2017 – way below current consensus and a loss of more than $100 million, while current estimates show an improvement versus the single digit earnings of Q1 2017. 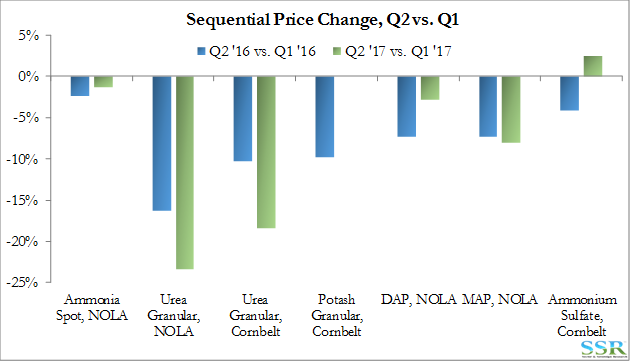 Last year we saw a substantial drop in Q2 pricing versus Q1, especially for Nitrogen, as shown in Exhibit 6, but it looks like this year the decline is steeper, partly offset by lower natural gas pricing in the US. CF missed Q2 2016 estimates by 50% despite a rest at the end of 2015 and another at the end of Q1 2016. Yara also missed Q2 2016, but estimates had fallen by more than 40% over the prior 5 months. 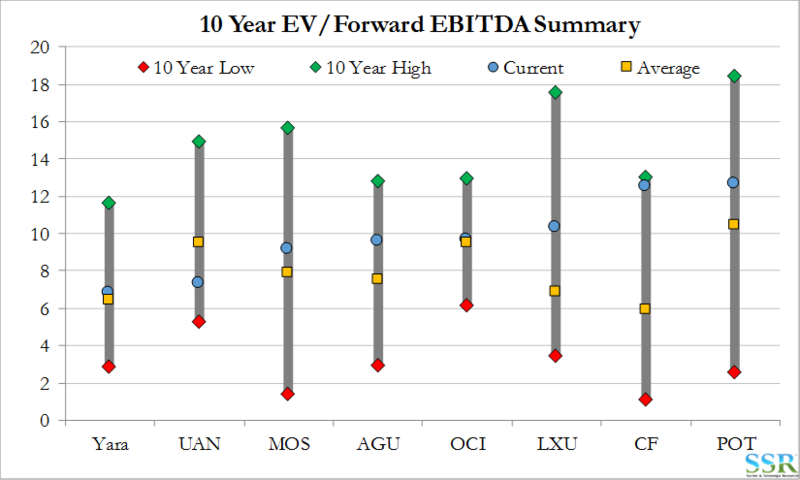 There are not enough estimates for LXU or UAN for the analysis to be meaningful. Both currently show expectations of a better year in 2017 than in 2016. Despite a likely very poor Q2, CF should generate enough free cash to cover its dividend and capex, given that the large projects are now complete – Exhibit 7. We estimate that the company should deliver around $450 million of cash from operations. Industry reshuffles like this, where trade flows move and price battles wage, generally result in some failures. We have seen this in the PVC chain and the ethylene chain in the last 20 years in the US and in Europe we have seen plenty of “rock bottom” deals with companies selling businesses for a fraction of replacement cost in periods of significant global oversupply. It was largely a change in trade patterns in PVC and its precursors – following rising costs in the US – that took Borden Chemical under in the US in 2001. In the nitrogen world the question is whether UAN and LXU can make it through? 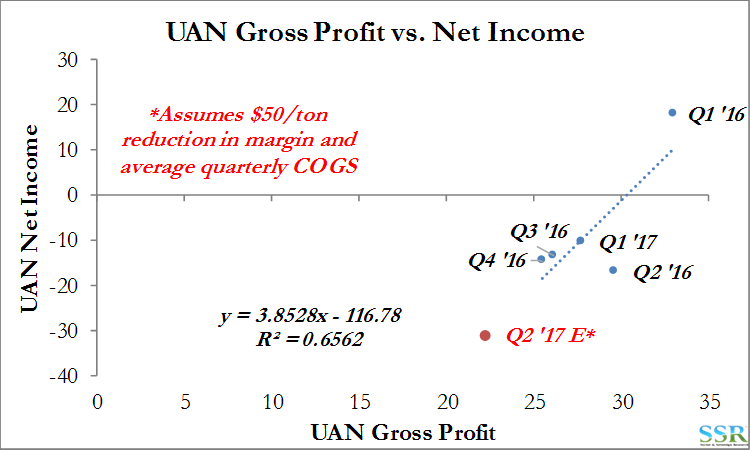 Everything is price dependent – if we get a quick recovery in 2017 then both companies could return to positive quarterly cash flows – in both cases, but especially UAN, the leverage to the equity value from a price recovery is extreme. However, if Q2 is indicative of the full year then LXU could run out of cash before year-end and UAN gets very close to that position. 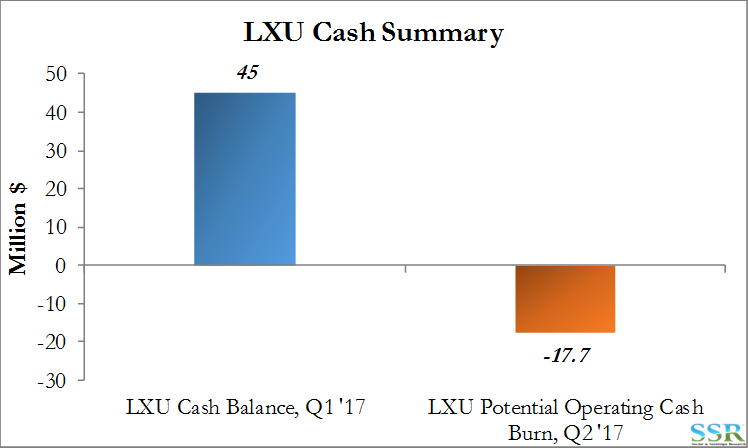 As shown in Exhibit 8, we think that LXU could burn through more than a third of its cash in Q2. The Q2 cash burn estimate is driven by the correlation in Exhibit 9. UAN does not look as bad – but UAN is very dependent on the oil/natural gas spread and while oil has fallen recently, natural gas has fallen further. 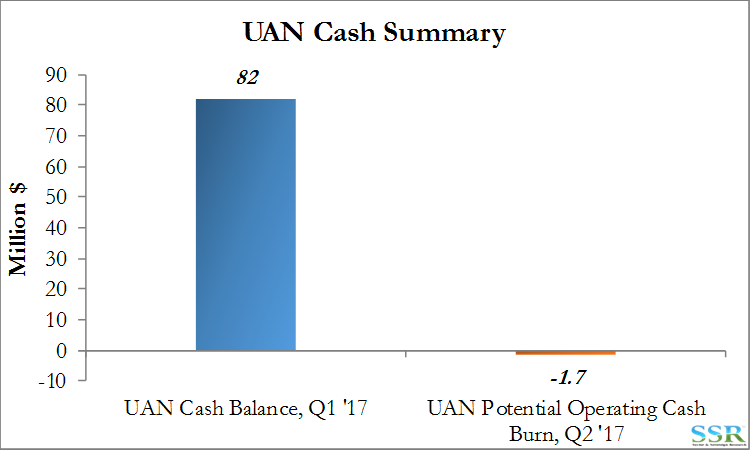 UAN’s potential quarterly Q2 cash burn is a much smaller portion of its current available cash. For both UAN and LXU it is the duration of the trough that will be the decider. If the US importers start to pack their tents and go home this year, then we could see some sustained price/margin recovery with next year’s application season. If the battle is still being fought at that time things could look quite bleak for both companies.